This weekend I'm off to Yarndale for the day, and I am am very excited! 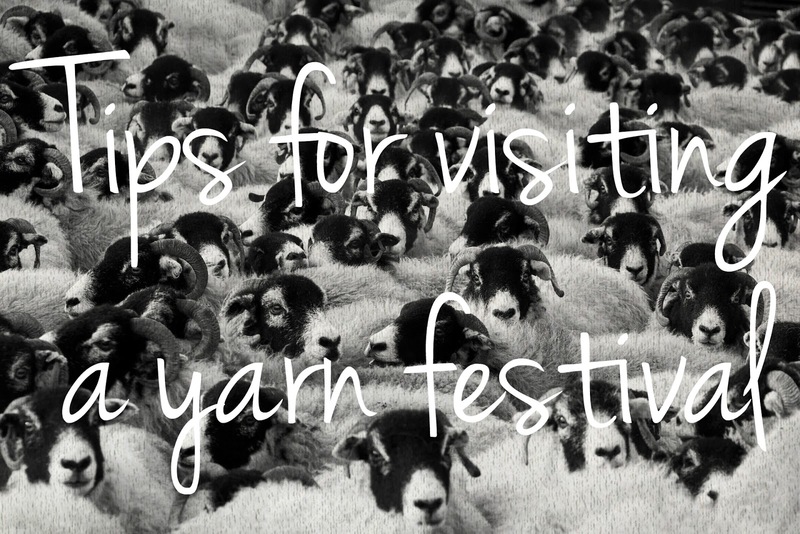 Having been to several yarn festivals, I thought I'd share a few of my top tips for visiting a yarn festival. If you're having to travel some distance to the yarn festival and need to stay overnight, book your accommodation as soon as you can. If the festival is somewhere small like Yarndale (held in Skipton, a market town in Yorkshire), accommodation will be limited and is likely to book up fast. If there's no accommodation available very locally, it's worth looking a little further afield and making a weekend of it. For last year's Yarndale I stayed in York with my friend Amy and we got to enjoy a visit to that city as well as the yarn festival. One thing to consider is how easy it is to get between the accommodation and the festival; Skipton has a railway station, so you can make life a little easier for yourself by booking accommodation in a town on the same train line - this will allow you a chance to have a rest on the train while getting back to your hotel in the evening, rather than having to drive after a long day. Yarn festival tickets are often available ahead of time, sometimes at a discount rate, or with preferential entry for advance ticket holders. Last year Edinburgh Yarn Festival, for example, gave priority to those with advance tickets, and advised those without tickets to arrive a little later in the day when numbers in the venue start to fall. I missed out on an advance ticket and was a little concerned about not getting in (it was fine in the end!). Some venues have parking outside, others don't, so it's a good idea to check before hand and work out what your plan for the day is. Yarndale provides a park and ride service, as well as a free bus to transport visitors from the town centre and railway station. I can also be nice to take a walk to the venue, especially if yarn bombing has been laid on to greet visitors. Most festivals release their vendor lists and maps several weeks before the event, which gives you the perfect opportunity to see who'll be there and work out whether there are any 'must see' vendors. If there is something you really want to buy, it can be worth making a beeline for that stall before the thing you want sells out. When you get to the yarn festival, it's really easy to be overtaken by yarn fumes and buy all sorts of things on a whim. In the weeks leading up to the festival, I make a mental plan of the things I'd like to buy, and work out roughly what they might cost. This can help to avoid overspending and buying things you might not really want when you get them home (or duplicating things you already have). I have been to yarn festivals with all sorts of budgets, and have had fun at each, regardless of how much I had allowed myself to spend. But I do always work out ahead of time what I can afford, and have that in my head before I set off. It really helps focus the mind if you know you can't buy everything! Some venues have restrictions on what you can take into the venue (the Yarndale organisers have requested that no suitcases or large rucksacks are brought in, and they'll be conducting bag searches on entry), so you should always check the festival website before you arrive. Not all festivals have cloakroom space; it's wise to check so you're not carrying too much stuff into the venue and are left lugging it round with you all day. You'll probably be adding things to your bag throughout the day, and don't want to be weighed down too much at the start. Yarn festivals can require a lot of walking, so I always make sure I'm wearing comfy, lightweight shoes. I also make sure I dress in layers so I can remove layers if I get hot once I'm in amonng the crowds. One of the most enojyable things about visiting a yarn festival is admiring everyone's knitwear. A yarn festival is the perfect place to show off something you've knitted that you're proud of! While most vendors will probably take cards, some won't, and others will have problems with their cards machine, so it's a good idea to take your budget as cash (this also helps you not to overspend). I also take some extra spare cash for food and drink or emergencies and keep it separate from my yarn budget so I don't accidentally spend it. While there are generally places to buy food and drink on site, the queues are often quite long, and I find that sometimes I want a break from the crowds, so would rather find a quiet corner and have a quick drink from my bag than queue. The one thing I always take to yarn festival is a notepad and pen. I find I can get really disoriented at yarn festivals, and struggle to remember where I saw a particular thing, so if I see something I like I make a note of what it is and who was selling it so I can go back later (or order it online at a later date if my budget on the day won't stretch that far). It's fairly inevitable that you'll ending picking up the odd purchase while you're at the festival, so it's good idea to make sure you have a bag to hand to keep your acquisitions safe and clean. Every festival I have visited has a knit and natter space for visitors to take a seat, have a rest and get their knitting out. Make the project small and easy - venues are often noisy and you won't want to be working on something that takes your full attention. I hope you've found these tips useful. Whether you're going to your first or your fortieth yarn festival, I hope you have a great time. Thanks for giving us a useful tip for visiting yarn festival. Its so nice of you. Your tips would definitely save our precious time.